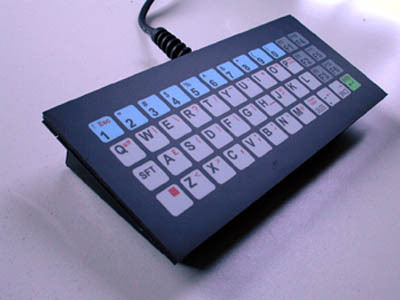 Programmable keyboards integrate directly with the operator and the system. By changing the colour and text applied to any key the purpose and functionality of the human interface is simplified and clarified. Manufactured from tough, black-anodised aluminium, the keyboards are available in desk-top or panel-mount format. The graphics are completely under the control of the customer. Click on the Graphic Template button at the top of this page to receive a file of 48 key templates with sample key legends, which can be easily changed using a standard graphic package (CorelDraw). Logos, artwork, and photographic images can all be incorporated in full colour and high resolution. The design is emailed to us for printing directly onto the polyester membrane using our digital print technology with fade-free inks and reverse printing for durability and scratch-resistance. There are no artwork or setting up costs.